providing a means to synthesise and interpret policy, planning and management evaluation information. 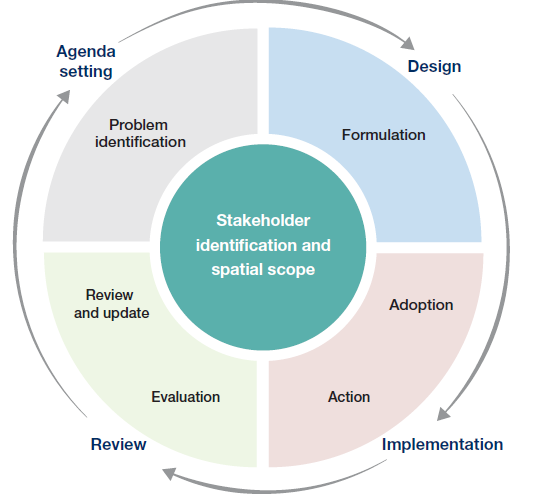 Many methods, approaches and tools exist to support activities in each phase of the policy cycle (Figure 2.1). A broad distinction is drawn between tools that support policy agenda setting and tools that support actual decisions in the policy design, implementation and review phases of the policy cycle. While the scenarios and models used in these two activities may be similar or identical, there are important differences in the way they are used that arise due to differences in the agenda-setting versus policy-design, implementation and review contexts. Figure 2.1. A theoretical framework for agenda setting, policy design, implementation and review. Although empirical evidence shows that real-world decision making does not usually follow an idealised sequence of discrete stages, the policy cycle helps organise the discussion of the role of scenarios, models and decision-support approaches in decision making that occurs in subsequent chapters. Numerous published frameworks exist that describe similar steps and approaches for structuring and implementing policy and decision making under uncertainty and complexity, including adaptive management and adaptive planning approaches.